Our original church building erected in 1877, stood until 1905, when, in order to accommodate an expanding congregation, additions were made at the front and rear. In 1925, with the formation of the United Church of Canada, a larger and stronger congregation was created. In recent years, as our community grew in numbers, the facilities of our existing building showed a need to be both expanded and improved. An addition was erected adjacent to the eastern side of the building and dedicated to ‘the Glory of God’’ on March 20, 1955. The new addition/new wing housed an enlarged sanctuary and Sunday School assembly, a furnace room containing two modern oil furnaces, three classrooms, a kindergarten room, parlor, minister’s vestry and a modern kitchen. Thanks to the addition, the seating capacity of the sanctuary was increased by 50%. On October 23, 1960 a new Christian Education Wing was opened and dedicated. In 1984, an elevator was installed and in 1990 an infrared system for the hearing impaired. An accessible automatic door was installed at the Banff entrance in 2015. Thanks be to God that we as a church family are blessed continually, with a wide cross-section of volunteers who contribute abundantly to the life and to the work of our church, Grace United Caledonia. When you enter the church sanctuary, one of the first things you will notice is our pipe organ. She, a lady of music, is beautifully designed, both inside and out. Throughout the years, so that Lady Pipe Organ could keep up with the times, avoid deterioration and speak through her pipes, the talents, prayers and gifts of many, have been called upon and gratefully appreciated. Our present pipe organ was not the first to encourage the Grace family to sing praises to the Lord. 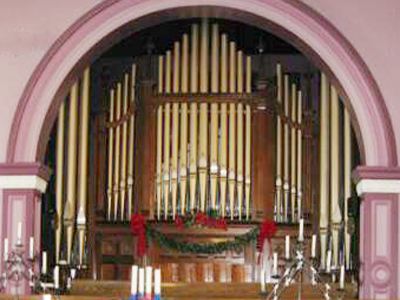 In 1878, a pipe organ, built by William Greenwood of Rockwood and paid for by the young people, sat in the sanctuary. She was powered by a lad who was paid ten cents a week to pump air into her bellows. Her tone was rich and melodious, far superior to the common reed organ. However, as grand as she was, in 1896, negotiations began with the firm of Edward Lye and Sons to either improve or replace her. She was replaced in 1897. Total cost --$550.oo plus Lady Pipe Organ 1878. Unfortunately by 1909, this new instrument was considered inadequate. The firm of Edward Lye & Sons was again contacted, this time to discuss rebuilding. The firm detailed the work entailed in using stops from the 1897 beauty and offered plans for rebuilding and enlarging. The proposal was approved and work began. Mr. George D. Atkinson supervised from his base in Toronto. On Monday evening, November 22, 1909, a ‘Service of Praise’ was held to celebrate the extensive rebuilding. Mr. Atkinson, who was also the organist and choirmaster at St. Paul’s Methodist Church in Toronto, played nine selections in order to demonstrate the wealth within the almost 900 speaking pipes and eighteen stops. In 1910, a music case and steps for the pumper were constructed. The pumper was now receiving forty dollars per annum. In 1913, the Board of Trustees purchased a motor and blower, thus making it possible for the organ bellows to be filled by a blower powered by an electric motor. Unfortunately, keeping up with the times, meant that the church lads said good-bye to their paying job. Early in 1949, it was noted that the mechanical (tracker) action of the organ was seriously deteriorating. The Lye Organ Company of Scarborough was able to rebuild. This entailed the installation of electro-pneumatic action throughout, some re-working of the chests, and alterations in the chamber. A new console was installed, with choir seating curving around it. For the first time, an organist could simultaneously play musical selections and direct the choir. The rebuilt organ, with beautiful pipes, two manuals and eighteen stops, was a fine lady. In 1986, the console was replaced with a used three-manual Casavant console and a Positif division of three ranks was added. This happened thanks to two benefactors--- Mr. and Mrs. Murray Clark and family, in memory of their daughter and sister, Joy Clark MacDonald and the church choir. A dedication service was held on Sunday, September 28th. The Postif division added to the tonal resources of the pipe organ, made available additional tonal colours and enhanced the brightness of the instrument’s sound. In 1988, two additional ranks of pipes, the Geigen Principal and Clarinet, were purchased. In 1996, the church sanctuary was renovated. In June of that same year, before work got underway, R.A. Denton & Son of Hamilton, pipe organ builders, were contacted regarding ways to protect the organ, and asked if they would inspect the golden pipes and offer thoughts concerning rebuilding the Casavant console. The organ builders felt that for several reasons, it wasn’t economically feasible or desirable to rebuild the console’s interior components. Rather than use the term ‘a rebuilding of the existing console’, R.A. Denton & Son stated in a proposal dated June 6/03--- “A more accurate description of what needs to be done is to build a new modern and enlarged 3-manual, drawknob console and fit it within the existing oak shell.” Thanks once again to the generosity of the Clark family, we have a magnificent console which was dedicated in honour of Erma Clark Mones on Sunday October 1, 2006. The Grace United Church family of today, thanks all from the past who took good care of our lady of music, who overcame obstacles in the process and who asked God’ for His help when the challenges seemed enormous.